For the second time, a Fulton County grand jury failed to indict a Union City cop in the shooting of 19-year-old Ariston Waiters on Aug. 6. Police officer Luther Lewis shot the unarmed Black teenager twice in the back as he lay facedown on the ground on Dec. 14, 2011. Police had been called to a disturbance at a house party. Waiters, who had not attended the party but was a bystander, attempted to leave the area when police ordered the crowd to disperse. Gun in hand, 250-pound Lewis pursued the 135-pound youth and ordered him to the ground. Lewis, an Afghanistan war veteran, claims he had his knee on Waiter’s back and was handcuffing him when Waiters reached for his gun. The forensic evidence showed no signs of a struggle, yet Lewis fired two shots at point-blank range. 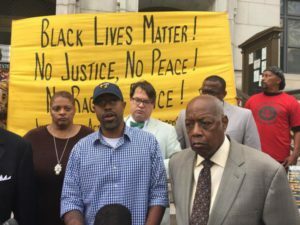 A May 2012 grand jury believed the officer’s account of the shooting, but Ariston’s mother, Freda Waiters, continued the fight for justice. She hired private investigator T.J. Ward, who discovered numerous discrepancies in Lewis’ version of the shooting. The Atlanta Journal Constitution newspaper and WSB Channel 2 News also launched investigations into the case. The result was new DNA evidence that refuted Lewis’ story. Two Union City police officers broke ranks and offered testimony about a department cover-up involving Chuck Odom, the police chief. Lewis’ previous disciplinary write-ups, including his drawing his gun on a Black motorist during a traffic stop, vanished from his file. The publicity about this and other evidence forced Fulton County District Attorney Paul Howard to reopen the case and convene a second grand jury. Georgia law allows police who face criminal charges not only to sit through the entire grand jury proceeding and hear the testimony, but also to address the jurors at the conclusion of the hearing. These statements, often emotional and contrary to actual evidence, cannot be cross-examined by the prosecutor. Despite the secrecy of grand jury proceedings, it is known that Lewis, who has resigned from the Union City police department, cried during his one-hour-and-45-minute presentation and cited his military service in Afghanistan. Reportedly, jurors were in tears as they left to deliberate. The grand jury decision does not have to be unanimous. It is not known how the 23 jurors voted, but the result was no indictment. Her attorney and supporters expressed their intention to pursue federal charges.